A bland one-trick comedy, The Major And The Minor suffers from a ridiculous premise, a lack of wit and phony execution. Frustrated with a series of dead-end jobs in New York City, Susan Applegate (Ginger Rogers) gives up on life in the big city and decides to return to her simpler roots in Iowa. Short of money for the adult train fare, Susan pretends to be 12 years old and buys a discounted child's ticket. On board the train she plays a cat and mouse game with the conductors to avoid detection. She finally hides in the compartment of Major Philip Kirby (Ray Milland), who is returning to his military academy where his smothering fiancée Pamela Hill (Rita Johnson) awaits. 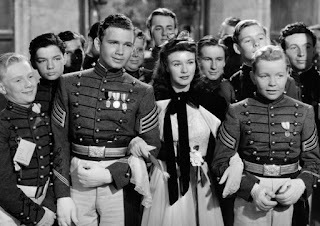 Philip falls for the child trick and takes Susan under his wing, housing her at the academy for a few days after train trouble delays her trip. She finds herself having to carry on pretending to be 12 years old, surrounded by lustful adolescent cadets. Pamela's younger sister Lucy (Diana Lynn) immediately sees through Susan's disguise, but more trouble awaits when Philip and Susan start to develop genuine feelings for each other. The first Hollywood film directed by Billy Wilder, The Major And The Minor has seedlings of ideas that would grow into better films in the future, notably the adults-in-disguise theme of Some Like It Hot. But in and of itself, The Major And The Minor is a flimsy and forgettable effort that has aged exceptionally poorly. There is very little that is funny about 31 year old Ginger Rogers unconvincingly pretending to be 12 for almost the entire duration of the film, and it's made worse with all the other adults in the story somehow falling for the lame deception. Train conductor, suspicious that Susan is not who she says she is: If you're Swedish, suppose you say something in Swedish. Susan: I vant to be alone. The romance never has an opportunity to gain traction, because Philip believes that Susan is 12. The adult affection he starts to develop for her is fundamental for the film and yet can only be icky. Susan is left to engage in a battle of surreptitious wills with the possessive Pamela, and starts to demonstrate the emotional maturity of a 12 year old by using juvenile antics to get between Philip and his chosen fiancée. The Major And The Minor is an inauspicious US debut for Wilder, neither major nor minor, just annoyingly discordant.